BOSTON, April 8, 2015 /PRNewswire/ -- More than ever, Americans are looking for small steps that lead them to healthier, longer lives. They're avoiding the office vending machine, they're walking that extra mile, and they're getting to the doctor's office for their regular checkups. Now, a life insurance company wants to recognize people for these healthy habits. 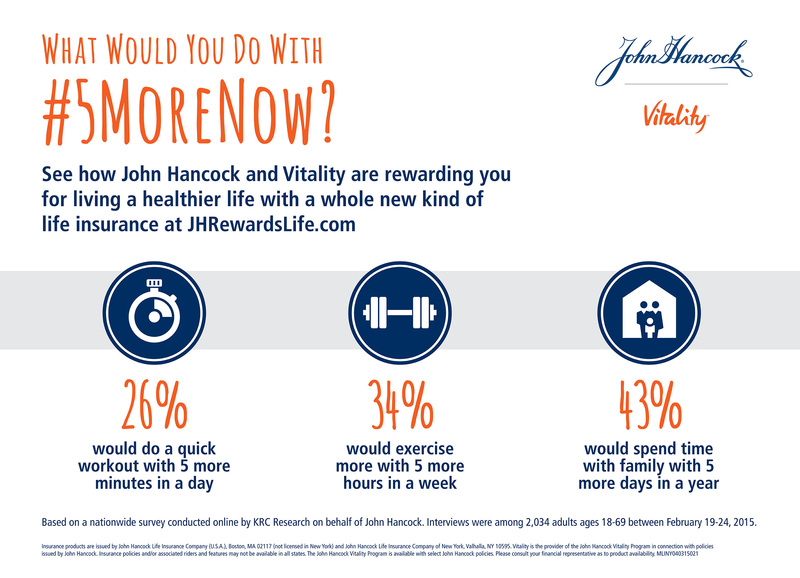 John Hancock, in partnership with Vitality, is offering a whole new kind of life insurance product that rewards consumers for living healthy, while protecting their loved ones. The company has teamed up with Chris O'Donnell, star of the hit drama NCIS: Los Angeles, to help consumers recognize they are in control of their physical, emotional, and financial health, and - even with a busy schedule - can take small steps to truly improve their quality of life, now. "Between filming and family, I know how hard it is to juggle everyday life and still fit in time to take care of my physical and financial health," says Chris O'Donnell. "Whether it's a round of golf to recharge with my sons, or a game of beach volleyball with the whole family, I try to share positive habits that keep us active now and healthy in the long-term." A father of five, O'Donnell knows the benefits of getting your health and wealth in good shape. Today, the actor will head to Grand Central Terminal in New York City to unveil the John Hancock Vitality Village at Vanderbilt Hall, encouraging visitors to invest in a longer, healthier life. The John Hancock Vitality Village will feature free healthy activities, from boot camp classes to nutrition demonstrations to relaxing massages, giving visitors an extra dose of health and wellness inspiration. Over a cup of coffee, visitors can also have a quick chat about their life insurance needs, and advisors will also be available to provide a free assessment of visitors' financial fitness. As part of the John Hancock Vitality Village, consumers can find out their Vitality Age, an indicator of overall health based on their lifestyle behaviors, including physical activity and nutrition habits. On average, Americans are five years older than their actual age. Unlike their actual age, individuals' Vitality Age can improve with better diet, exercise, and lifestyle choices. "Knowing your Vitality Age can help you set reasonable goals, and it's a powerful motivator to stay on the road to healthy living," said Derek Yach, Executive Director, The Vitality Institute. "Now is the time for people to take hold of their physical, emotional, and financial wellness, and we're thrilled that we can help." A recent survey of Gen Xers and Baby Boomers, commissioned by John Hancock, revealed that health takes priority in their lives. Nearly all surveyed (94% percent) think they could be living healthier, and more than 50 percent said they are very likely to walk more in 2015. With such busy lives, it's no surprise Americans wish they could get five more--five more minutes, five more hours, even five more days in a year. When asked what they'd do with five more minutes in a day or five more hours in a week, both men and women were most likely to devote the extra time to exercise and physical health. When given the prospect of five extra days in a year, the focus turned to emotional health, with 43% of people saying they would spend the extra time with their family. John Hancock life insurance with Vitality helps people invest in both their health and wealth and work toward securing their financial future while pursuing a healthier, longer life. Through its exclusive partnership with Vitality, the global leader in integrating wellness benefits with life insurance products, John Hancock is offering a whole new kind of life insurance solution that gives consumers the opportunity to significantly save on their premiums and earn valuable rewards and discounts--simply by living a healthy life. For example, a 45 year old couple (of average health) buying Protection UL with Vitality life insurance policies of $500,000 each could potentially save more than $25,000 on their premiums by the time they reach 85, with additional savings if they live longer, assuming they reach gold status in all years. "The latest advancements in technology are encouraging people to take a more active role in their health," said Michael Doughty, President and General Manager, John Hancock Insurance. "It's time we applied these innovations to recognize and reward those who to take a more active role in their finances as well." The program, which integrates with personalized health technology, including wearables like Fitbit®, offers participants rewards and discounts from major brands such as Amazon, Hyatt, and REI, just for walking, having regular check-ups, and engaging in other everyday healthy activities. Tune in to JHRewardsLife.com/announcement on Wednesday, April 8 at 10 a.m. ET, to learn more about John Hancock's new life insurance solution via a live, online broadcast. Check back for more information and tools to help make small changes toward a healthier lifestyle. This nationwide survey was conducted online by KRC Research on behalf of John Hancock. Interviews were completed in February 2015 among 2,034 adults ages 18 – 69. The data were weighted by age, gender, geographic region, race, and education to accurately represent the U.S. population. John Hancock Financial is a division of Manulife, a leading Canada-based financial services group with principal operations in Asia, Canada and the United States. Operating as Manulife in Canada and Asia, and primarily as John Hancock in the United States, our group of companies offers clients a diverse range of financial protection products and wealth management services through its extensive network of employees, agents and distribution partners. Manulife Financial Corporation trades as 'MFC' on the TSX, NYSE and PSA, and under '945' on the SEHK. Manulife can be found on the Internet at Manulife.com. The John Hancock unit, through its insurance companies, comprises one of the largest life insurers in the United States. John Hancock offers and administers a broad range of financial products, including life insurance, annuities,investments, 401(k) plans,long-term care insurance,college savings, and other forms of business insurance. Additional information about John Hancock may be found at johnhancock.com. The Vitality Group is a member of Discovery Ltd., offering an incentive-based wellness program to employers as part of their benefits program. With a foundation based on actuarial science and behavioral economic theory, Vitality encourages changes in lifestyle that reduce health care costs, both in the short run and long term, by rewarding members for addressing their specific health issues. Vitality wellness programs serve companies in a wide range of sizes and industries, improving individuals' health and wellbeing as well as employers' bottom lines. Vitality brings a global perspective through successful partnerships with large employers and best-in-class insurers around the world, in countries including the United States, United Kingdom, South Africa, China and more recently Singapore and Australia. Insurance products are issued by John Hancock Life Insurance Company (U.S.A.), Boston, MA 02117 (not licensed in New York) and John Hancock Life Insurance Company of New York, Valhalla, NY 10595. Insurance policies and/or associated riders and features may not be available in all states. 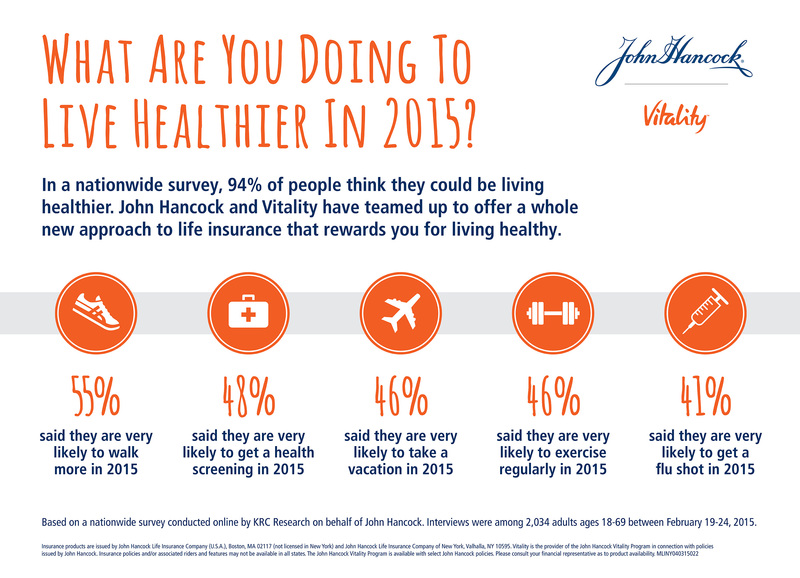 The John Hancock Vitality Program is available with select John Hancock policies. Consumers should consult their financial representative as to product availability and how premium savings may affect the policy they purchase. Rewards may vary based on the type of insurance policy purchased for the insured (Vitality Program Member), the ownership and inforce status of the insurance policy, and the state where the insurance policy was issued.